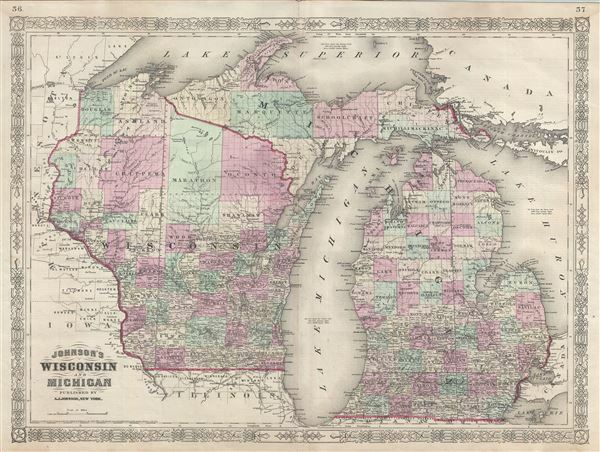 This rare 1866 map by A. J. Johnson offers a fascinating snapshot of Michigan and Wisconsin at the height of the American Civil War. The map depicts both states in full with color coding according to county. Showa excellent Great Lakes detail with Lake Michigan in full and parts of Lake Superior and Lake Huron. Various towns, cities, railways, roads, rivers and several other topographical features are noted with relief shown by hachure. Features the fretwork style border common to Johnson's atlas work from 1863 to 1869. Although copyrighted to 1864, this map was published by A. J. Johnson as plate nos. 56 and 57 in the 1866 edition of his New Illustrated Family Atlas of the World. Very good. Minor wear and verso repair along original centerfold. Minor spotting at places. Minor verso repair on edges.